To Cite: Ali Algadiem E, Aleisa A A, Alsubaie H I, Buhlaiqah N R, Algadeeb J B, et al. Blood Loss Estimation Using Gauze Visual Analogue, Trauma Mon. 2016 ; 21(2):e34131. doi: 10.5812/traumamon.34131. Background: Estimating intraoperative blood loss can be a difficult task, especially when blood is mostly absorbed by gauze. In this study, we have provided an improved method for estimating blood absorbed by gauze. Objectives: To develop a guide to estimate blood absorbed by surgical gauze. 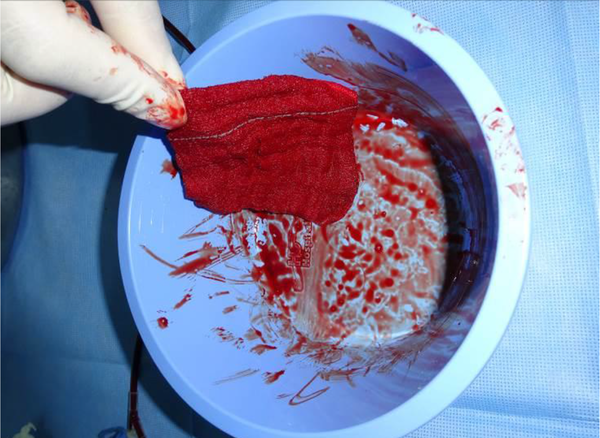 Materials and Methods: A clinical experiment was conducted using aspirated blood and common surgical gauze to create a realistic amount of absorbed blood in the gauze. Different percentages of staining were photographed to create an analogue for the amount of blood absorbed by the gauze. Results: A visual analogue scale was created to aid the estimation of blood absorbed by the gauze. The absorptive capacity of different gauze sizes was determined when the gauze was dripping with blood. The amount of reduction in absorption was also determined when the gauze was wetted with normal saline before use. Conclusions: The use of a visual analogue may increase the accuracy of blood loss estimation and decrease the consequences related to over or underestimation of blood loss. Visual estimation is the most common method to estimate intraoperative blood loss, but it is not the most accurate (1). Estimating blood loss might be difficult, especially if most of the blood is absorbed by surgical gauze and not collected in the suction bottle (2). Although many methods for estimation are available, e.g., the gravimetric method (weighing of the pre- and post-procedure gauze), most are not in routine use either due to their unavailability or time-consuming nature during surgical procedures (1). In the literature, there are few tools to improve visual estimation (1, 3). Thus, improving visual estimation is crucial for accurate estimation of blood loss. The aim of this study was to develop an analogue that can be easily remembered by the staff and used to estimate blood absorbed by surgical gauze. A cross-sectional study was carried out to determine the absorptive capacity of surgical gauze along with a case-control study to determine the absorptive capacity of gauze wetted with saline and supersaturated as compared to dry gauze. Three different sizes of commonly used surgical gauze (10 × 10 cm, 30 × 30 cm, and 45 × 45 cm) were tested for their absorptive capacity and used to reconstruct the analogue. Using personal protective equipment, a measured amount of expired whole blood (tested negative for blood-borne diseases) was spilled into a bowl (simulating operative bleeding). Then, a resident was asked to dry the blood. The blood spill was gradually increased (Figure 1). The increment in blood spill was 3 ml in the 10 × 10 gauze, 10 mL in the 30 × 30 gauze, and 40 mL in the 45 × 45 gauze. The stains that resulted from this spill were photographed for the visual guide. After the gauze testing was complete, four patterns were selected for each gauze to construct the visual guide. Each pattern represented 25%, 50%, 75%, and 100% saturation. Then, supersaturation of the gauze was determined by adding more blood to the 100% saturated gauze. Supersaturation was determined by the inability of the gauze to absorb extra blood from the bowl and beginning to drip from the gauze (Figure 2). This was repeated with pieces of wet gauze. Wetting of the gauze pieces was achieved by dipping them in normal saline and squeezing out the excess saline. The below guide shows the pattern of staining and absorptive capacity of each gauze (Figure 3). Wetting of the gauze decreased the absorptive capacity to 25% (dry 12 mL vs. wet 9 mL) in the 10 × 10 cm, 30% (dry 100 mL vs. wet 70 mL) in the 30 × 30 cm, and 25% (dry 160 mL vs. wet 140 ml) in the 45 × 45 cm gauze. Supersaturation of the gauze increased the absorptive capacity to 25% (12 mL vs. 15 mL) in the 10 × 10 cm, 30% (100 mL vs. 130 mL) in the 30 × 30 cm, and 25% (160 mL vs. 200 mL) in the 45 × 45 cm gauze. Figure 3. Visual Guide for Determining Blood Loss for Three Different Sizes of Gauze.There was a 25% increase in total absorptive capacity when the gauze was dripping (supersaturated) and a 25% decrease in each category when the gauze was wet. A patient losing blood during any surgery is a concern for both the surgeon and anesthetist. Precise estimation of blood loss is crucial because underestimation may lead to significant complications, and overestimation and unnecessary transfusion may increase complications and mortality (4, 5). There are many methods for intraoperative blood loss estimation, e.g., gravimetric, photometry, and visual estimation, but the most used method is visual estimation. Other methods are not widely used due to their unavailability, impracticality, or time consumption, e.g., gravimetric method, as the gauze must be weighed pre- and post-use (1, 5). Although visual estimation is a commonly used method, it is the least accurate (1, 2). The discrepancy in visual estimation is not only between the actual blood loss and the estimated amount but also between the anesthesiologists who tend to overestimate and the surgeons who tend to underestimate blood loss (6, 7). This discrepancy may lead to a conflict with transfusion decisions as anesthesiologists depend on the clinical judgment as the only factor for intraoperative transfusion (8, 9). The estimation becomes more challenging when the surgeon uses saline-wetted gauze, as this decreases the absorptive capacity of the gauze, or when the gauze is supersaturated and dripping (Figure 4). Figure 4. Different Pictures From Three Real Surgeries Showing the Amount of Blood That Gets Absorbed in Surgical Gauze.Three different sizes of gauze were used intraoperatively with different percentages of soaking. Some of these gauze pieces were wetted with normal saline before use, so the amount of blood absorption would be less. Many investigators have attempted to devise new methods for an accurate determination of blood loss. Teaching staff how to estimate blood loss has shown to be effective in increasing the accuracy of visual estimation (1, 10-12). In most of the published articles on improving visual estimation, a clinical scenario or pictures of blood stains have been used to test or teach the targeted group; these studies have shown that visual analogues and scenarios are a good methods for teaching (1, 10-12). Assessment of the staff before teaching showed that their years of experience (resident vs. attending faculty estimation) did not improve the estimation accuracy (10, 12, 13). This fact raised the need for a method that would increase the estimation ability in all staff rankings, experience or no experience. Although a significant reduction in error was shown after teaching in these studies, none of them showed a perfect estimation of blood loss. This means that any tool that improves the visual estimation will have a margin of error (1, 10-13). 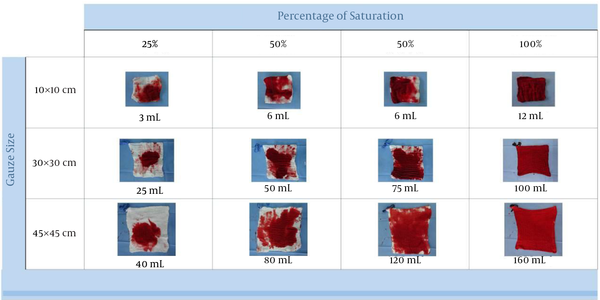 In the experiment, aspirated whole blood was used to simulate a true blood stain, and a random pattern of staining was also done by simulating a realistic scenario of blood loss (Figure 1). All of this was done to avoid pitfalls that may happen due to the use of a colored solution or dipping the gauze directly into the blood. In addition, we tested the absorptive capacity of gauze when wetted with saline or dripping with blood because these situations have never been tested before in other studies and have a significant effect on the amount of blood absorbed by the gauze. There were some limitations in our study. First, as shown by previous studies, there will be some error in estimation even when using such an analogue. Thus, this analogue will decrease the error but will not eliminate it. Second, the analogue was constructed by testing a certain type of gauze that is commonly used in hospitals. If another type or size of gauze is used, this analogue may be inaccurate for use in all situations (14). Care should be taken when estimating blood loss by visual estimation. The use of clinical guides improves the visual estimation and decreases the error when estimating blood that has been absorbed by surgical gauze. We acknowledge the King Fahad hospital research and ethical committee for their help and guidance throughout the study process and publication. Authors’ Contribution: Dr. Emran Algadiem: concept, design, definition of intellectual content, literature search, data acquisition, data analysis, manuscript preparation, manuscript editing, manuscript review, guarantor; Dr. Abdulmohsen Aleisa: concept, design, manuscript preparation, manuscript editing, manuscript review; Dr. Huda Alsubaie: literature search, clinical studies, experimental studies, manuscript review; Dr. Noora Radhi Buhlaiqah: literature search, clinical studies, experimental studies, manuscript review; Dr. Jihad Algadeeb: literature search, clinical studies, experimental studies, manuscript review; Hussain Alsneini: literature search, clinical studies, experimental studies, manuscript review.